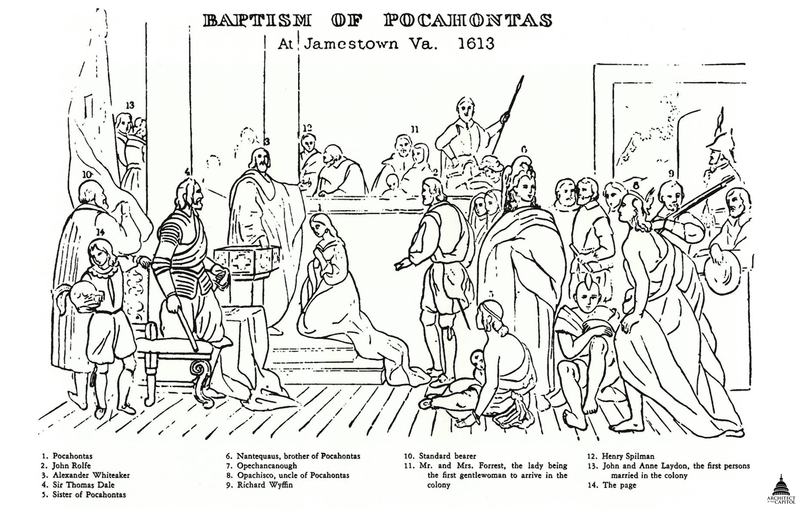 This painting depicts the ceremony in which Pocahontas, daughter of the influential Algonkian chief Powhatan, was baptized and given the name Rebecca in an Anglican church. It took place in 1613 or 1614 in the colony at Jamestown, Virginia, the first permanent English settlement on the North American continent. Pocahontas is thought to be the earliest native convert to Christianity in the English colonies; this ceremony and her subsequent marriage to John Rolfe helped to establish peaceful relations between the colonists and the Tidewater tribes. The figures of Pocahontas and the officiating minister are given prominence by their placement, their bright white clothing, and the light that shines upon them. Pocahontas kneels on the top level of a stepped dais, her head bowed and her hands clasped before her. Reverend Alexander Whiteaker raises his eyes and his left hand, while his right hand rests on the baptismal font. John Rolfe, Pocahontas’s future husband, stands behind her. Other colonists and members of Pocahontas’s family look on, displaying a range of emotions. At the left of the painting, Sir Thomas Dale, deputy governor of the colony, has risen from his chair near the font to observe the event. Pocahontas’s regally dressed brother, Nantequaus, turns away from the ceremony as her uncle Opachisco leans in from the right. The seated, brooding figure of another uncle, Opechankanough, turns completely away from the ceremony while Pocahontas’s sister, with an infant, watches from the floor. Chapman received the commission for the Rotunda painting in 1837 and selected Pocahontas as its subject. He may have chosen to paint her baptism because he had already (in 1836) completed a scene that showed her more widely depicted rescue of John Smith. Seeking to depict the scene of this ceremony accurately, Chapman traveled in England and America to examine objects and buildings from the early 17th century. Because the Jamestown church had since been torn down, he based his setting on a church that he believed to be of similar age and incorporated features appropriate to the colony, such as the pine columns; many details were based on a written description by a Jamestown resident. Chapman created this painting in Washington, D.C., in the loft of a barn on G Street, NW. His life during the time in which he worked on it was marked by great sadness and misfortune: his son died in February 1838, and two weeks later his daughter was born prematurely and survived only ten hours. He was also under mounting pressure from debts and worked quickly on the canvas to collect his payment; after completing it he noted in his day book that the money he received from the government for the painting was “barely equivalent to its cost” to him. The painting was delivered to the U.S. Capitol and installed in November 1840. This painting has undergone various cleaning, repair and restoration treatments. In 1925, it was relined because of the damage it suffered from currents of heated air rising from the floor registers. Finding a manufacturer in the United States to provide such a large canvas proved difficult, and the canvas was eventually ordered from a company in Brussels. In 1980 the painting was attached to an aluminum panel to help it resist the effects of changes in temperature and humidity. All of the Rotunda paintings were most recently surface cleaned in 2008. An engraving of Chapman’s painting appeared on the reverse of the First Charter $20 National Bank Notes issued in 1863 and 1875. John Gadsby Chapman was born on August 11, 1808, in Alexandria, Virginia. He received encouragement and instruction from history painter George Cooke and portraitist Charles Bird King, and he studied further in Philadelphia. In 1828 he traveled to Italy to study the Old Masters, and in 1831 he returned to America to create landscapes and portraits, which he exhibited in Washington, D.C., Richmond and Philadelphia. He moved in 1834 to New York City, where he became a member of the National Academy of Design and illustrated books and magazines. He also began a series of history paintings depicting events in colonial-era America, and their success led to the commission for Baptism of Pocahontas, his best-known work. In 1850 he and his family settled in Rome, where he prospered by selling his works to American tourists. In the 1860s, however, the Civil War curtailed tourist travel; in the 1870s his wife died and he relied on fellow Americans for charity. His health failing, he returned to the United States in 1884 and lived with his son in Brooklyn. He died on November 28, 1889.